After 34 years in the Paynesville Area School District, teacher Wayne Hanson retires. When Wayne Hanson applied for a job at Paynesville Middle School in 1971, he and his wife, Pat, planned on staying for only one year. Hanson is now retiring after his 34th year in the Paynesville Area School District. Hanson, originally from Duluth, graduated from Bemidji State University in 1971 with a degree in elementary and middle school education. He applied for a position as a sixth grade Minnesota history teacher in Paynesville the fall after he graduated. The next spring, Hanson got a call from a school in Duluth offering him a teaching job. After growing up in Duluth, Hanson said he didn't want to go back to the big city. He enjoyed the small-town life. In his 34 years at the Paynesville schools, Hanson has taught just about every subject. After four years in Minnesota history, he taught sixth grade English for four years. He then taught two years of sixth grade math, a few years of science, three or four years of seventh grade math, and then a few years of geography. Hanson also taught seven or eight years of summer science. Hanson recalls that he never really knew until right before school started what subject he would be teaching in the fall. Wayne Hanson will retire at the end of this school year after having taught in the Paynesville Area Schools for 34 years. One fall, two days before school started, Hanson said, principal Deb Gillman called him and told him that they didn't have an industrial arts instructor and asked Hanson if he would be willing to try it and take some classes to get certified. Hanson accepted the offer and got his certification. 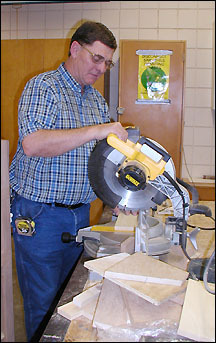 Along with a few sections of math and geography, he has been teaching industrial arts for the last 12 years. Having taught so many different subjects, Hanson said that he got to see every kid in a different light, whereas some teachers only see a student succeed or not succeed in just math or science. To be able to teach in as many different departments as he has, Hanson has had to further his education in almost every department. He has done graduate work at many universities including Hamline, St. Cloud State, the University of Minnesota, and St. John's. Hanson has enjoyed teaching industrial arts the most, he said, because kids who don't do as well in academics usually are very successful with hands-on projects. Having 12- and 13-year-olds run power equipment is scary, he said. But in the 12 years that he has taught industrial arts, there has only been one injury, and he was gone that day. "The rewards of teaching are amazing," Hanson said. Seeing former students in the community, being involved in the church, and seeing them raise families of their own is great. The biggest struggle that Hanson has faced while teaching is wondering if he got through to the kids. "Some days you get home and wonder if you got anything accomplished at all," he said. In addition to teaching many different subjects, Hanson also had a part in many different athletic programs in Paynesville. He has coached girls' and boys' basketball, fifth and sixth grade football, wrestling, and Jaycee wrestling. Hanson has seen many changes in his 34 years in Paynesville. "Kids are different," he said. "They're still good though. Every kid has a good side and every kid has good points. All of them." Sometimes when he's in the classroom, Hanson admits that he wonders if retiring is the right thing to do because he enjoys his job so much. "I love education," he said, "and I love the kids. I will miss the whole thing. Even the headaches that go with it." "I've worked with some great people," he added, "and after I leave, I will still get to be with some of those people, except I will be hunting and fishing with them instead of teaching with them." Getting summers off is something that Hanson also looks forward to in his retirement. "I haven't had a summer off in my whole life," he said. "Every summer I have been either building houses, going to school, or teaching summer courses." For 15 years, Wayne and Pat owned PJ's Appliances in Paynesville. Working two jobs is something that Hanson has gotten used to over the past 34 years. He currently works at M&M Lumber, aside from teaching. Now that Hanson has reached the rule of 90 (when his years of experience plus age equals 90) he has decided that it's a good time to retire. During his retirement, Hanson plans to lay low and take advantage of having time off. He plans to spend time with his family and babysitting his granddaughter. He and Pat have no intention of moving away from Paynesville, he said. "It's home," he explained. "You can't find a community more supportive than this. It's great."